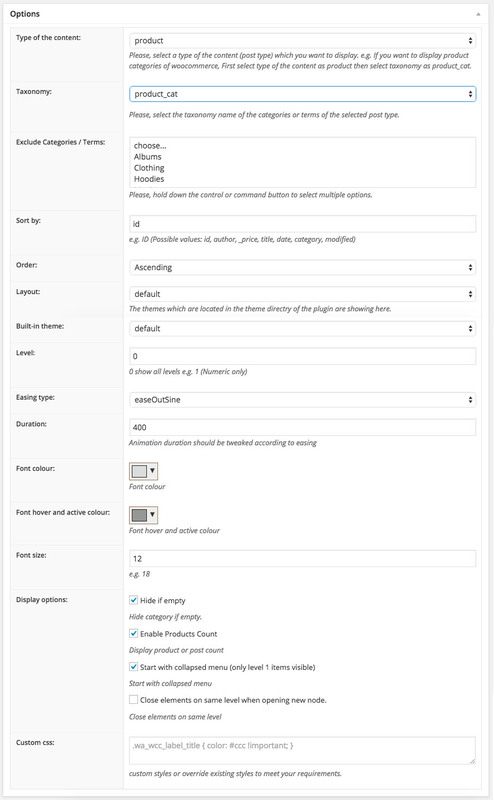 This plugin allows you to create an expandable list of product categories and subcategories. 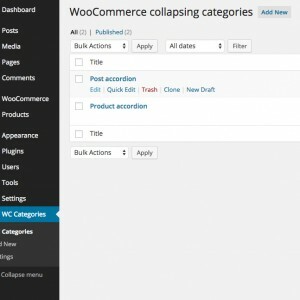 Collapsing categories for WooCommerce WordPress plugin allows you to list wooCommerce’s product or any post type terms/categories and subcategories into a toggle accordion with expand / collapse option. 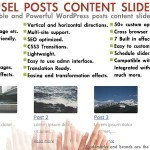 This plugin is built with WordPress best practices and guidelines. 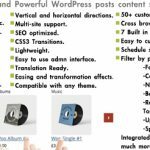 It is also integrated with automatic updates which allows you to update the plugin through the WordPress dashboard like normal plugins. Categories can be displayed from any post type. 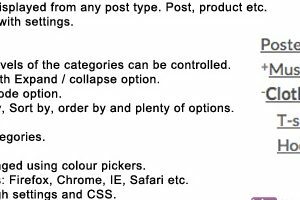 Post, product etc. Easing speed and levels of the categories can be controlled. Toggle Accordion with Expand / collapse option. 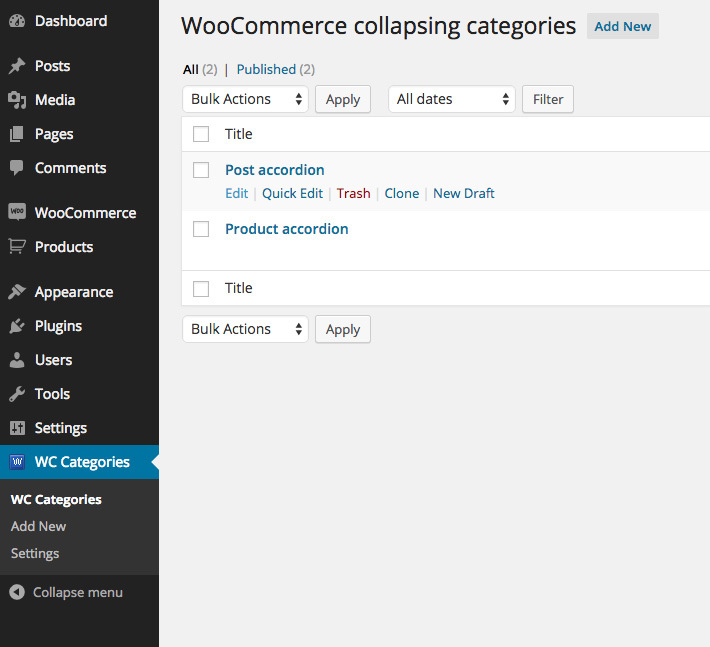 Hide empty category, close elements on same lavel, expand all by default, Sort by, order by and plenty of options. Colours can be changed using colour pickers. 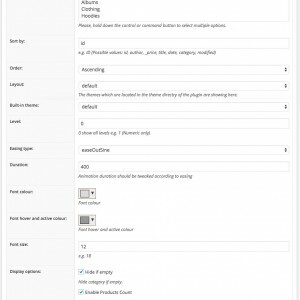 Customizable through settings and CSS. Installation document and user guide. An easy way to show product categories on any page or widget. 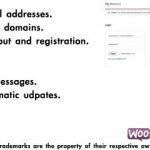 This pro version has several convenient formatting options not available with the free version. 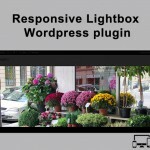 I had an issue related to how I was using the plug-in and got helpful support. I gave a four instead of five star rating for one reason: Only the lowest level subcategory on each branch of the hierarchy is clickable. If it had a way to show, for example, both a “+/-” beside each category/subcategory to accordion it *and* a clickable link on the text to go to each applicable section in the store, this would be a five star plug-in.